It's the Christmas season again. With teenagers in the house who are very active in the MYF you can't help but be swept along with the excitement of the celebration. This year we decided to help out again by providing transport. This year's carollers included three primary kids. Two of them, Jasmine and Monica followed our car along with Eucharia who is an African studying in a nursing school here. Tiffany took care of the little ones along with Charmaine. So the car was packed. First stop was a nursing home. Uncle Ben's father is here. So we brought Christmas cheer to him. The MYFers are trained to shake hands with everybody in all the homes they visited. They did a pretty good job. Next was singing at Terminal 1. It wasn't easy as the sound system was bad. They had to sing for an hour. 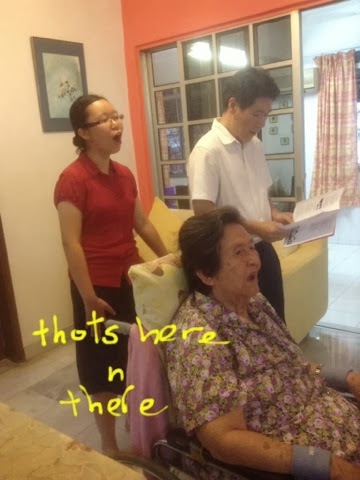 They were invited to return on the next day to sing again. The second day was worse. A few carollers dropped out of the group and a few more were having sore throat. Tough job but they were of good cheer. On the second day, after Terminal 1 the carollers came to our house. After the previous day experience, I knew they would be hungry. Indeed they were. We had satay which came a little late. Thank God there is uncle Hoe who helped to get the satay from the shop. Fish balls were the most popular....surprisingly. It's the cheapest and easiest to prepare. They finished everything. We had cupcakes too .. I got them from Ai Poh. Jelly was just so so. Junk food....dark chocolates and a variety of nuts. So good to see them eating heartily. On the second day there was slight drama. The van which Rosheen drove broke down. It's quite horrifying to see how he drives and the loud protests from the van. We stopped to help them. The boys pushed and we tried to jump start. Didn't work. Battery and other ailment .... It's an old van. The boys call it the party van. The whole group made so much noise and had so much fun. So when they got down to push the van they had great fun too. Zhi Quan asked me to take pictures of him pretending to push the van. Anyway they split to two cars. I followed Nicholas' car. Felt there need be an adult with a 17 year old driver. He handles the car very well. We visited Bishop Emeritus Hwa Yung and Bee Teik's house. They were so excited and happy to have us over. Bee Teik has been a great mentor and big sis to me. I'm so glad she is back in Seremban again. It was good spreading cheer around this season. It was definitely tiring but being with the teens and seeing them happy makes me feel fulfilled this Christmas. May the love of God and the spirit of cheer be upon the hearts of all readers this Christmas. God bless all of you.